The Middle East is a variegated and colourful universe when it comes to clothes and attires for both men and women. It is a complex reality where local traditions and Western fashion mix. While the latter has deeply influenced Arab countries, it is still possible to spot some traditional garments. In this guide we will first deal with some of the most common stereotypes about Arabs and clothing, then consider the traditional garments worn in different countries, starting from Morocco down to Oman and understand how the concept of “modest dress” drastically changes from one country to another within the region. Finally, you will have the opportunity to test how much you remember about Arab clothes with a quick quiz. Age and location make a big difference when it comes to clothing in the Middle East. On the one hand, younger people tend to wear Western clothes and use their traditional outfits only for special occasions such as weddings, religious celebrations or a pilgrimage, while the older generations are more easily seen with traditional garments. On the other hand, people living in the cities are more attentive to the latest fashion trends, while in smaller towns and rural contexts men and women still prefer traditional attires because of their comfort and the protection they offer from the sun, the wind and the sand. A third factor could be social class. On the one hand, designer clothes from the West are very popular among the middle and upper class, while traditional garments and more conservative attires might be more easily found in popular neighbourhoods. While this could be true for certain countries in the Levant and North Africa, the criteria most definitely change for Gulf countries where all women and men wear similar clothes and it is actually the quality and design of the abaya, an expensive bag or a pair sunglasses to reveal the social class of the wearer. Before analyzing which clothes belong to which country we must clarify some general misconceptions related to Middle Eastern clothing, as well as introducing the basic terms of Arab fashion. 1) All Arab women wear hijab. 2) The hijab is a headscarf. YES. The term hijab is commonly used to refer to the headscarf worn by many Muslim women. But the word hijab does not only refer to the short veil wrapped around a woman’s head. Hijab is in fact also a general term for modest attires which include head covering. 3) There is only one kind of veil. NO. The term veil includes a notable variety of head gears which come in a multitude of shapes, lengths and fabrics. There are different kinds of veil and women wear them not only as a religious or cultural sign of belonging to a certain society, but also consider them an important fashion statement. Hijabs have different styles and colours and women wearing a hijab (muhajjabat in Arabic) are always up to date with the latest trends, just as Western women know whether an item is out-dated or not. A clear instance of how hijab fashion changes and evolves is the so-called “Gamboo’a”, literally “Camel hump”. It was really fashionable around 2008 when women sported voluminous hijabs using a clip with a huge plastic flower (the gamboo’a) under the headscarf. It soon became very popular, especially in the trendsetter country of the region: the UAE. However, by 2011 it was already considered out of fashion. 1. SHAYLA: it is a one-piece veil. A long scarf which is wrapped around the head, pinned under the chin and gently rests on the shoulders. It is usually worn on top of a cap of a matching colour, which helps to keep the hijab in place. The rim of the cap may or may not be shown according to the woman’s preference. It can be seen in the Middle East, even though it is particularly widespread in the South East Asian Muslim community. 3. NIQAB: a face veil which is usually worn with a headscarf and tied behind the head. It leaves a gap for the eyes only, even though some women add an eye veil which allows them to see without revealing their eyes. 4. KHIMAR: is a long veil which covers the head and the chest till the waist. The face is left uncovered. It is not as popular as the previous types of head covering; still some women wear it in their daily life. 4) Some Arab women wear a burqa. NO, generally speaking. This is an item characteristic of Pakistan and Afghanistan and was imposed by the Talibans and it is not paramount in the Arab world, even though some countries such as Yemen have their own version of the burqa (or burghaa) which differs from the Afghan one. 5) All Arab men wear a long, white robe and a coloured headscarf. NO. Only men in the Gulf are used to daily wear the headscarf and the white robe.The headscarf (ghuthrain the Gulf, keffiah in the Levant) is tied on the head with a black piece of cord (aghal) and is used with a skullcap called thagiyah which keeps the hair in place. The white robe, called thoub/thobe, dishdasha or kandora, is the main item of clothing for Gulf men and is generally worn with a pair of loose fitting trousers called sirwal, either long or short. While the keffiah is also used in Palestine and Jordan, the dishdasha remains the landmark of Gulf men’s fashion. Among one of the most interesting surveys about clothes ever conducted in the region is the following one, conducted by the University of Michigan’s Institute for Social Research. 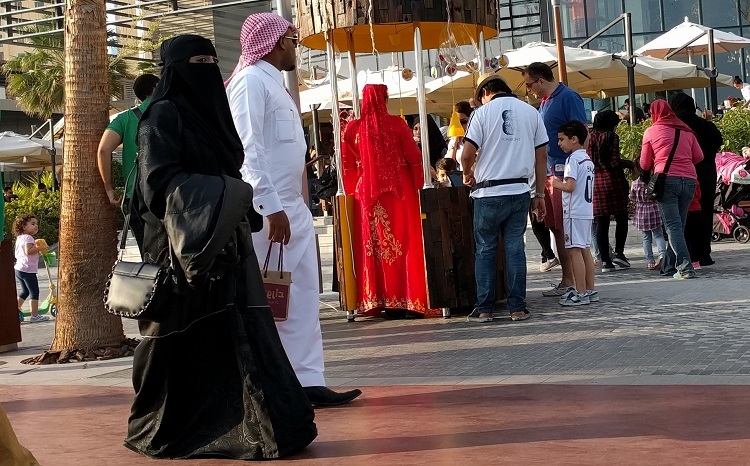 It shows how the perception of decency and modest clothing dramatically changes from one country to the other within the Middle East. Most of the times we will see how these opinions are then reflected in the way Arabs dress. For example, it is indeed true that many women in Lebanon do not cover their hair, on the contrary, the majority of women in Saudi Arabia wear a niqab. Now that we have some basic vocabulary related to men’s and women’s fashion in the Arab world, it is time to see what their attire can tell us about the country of origin and, in some cases, their social class, too. We can identify 4 main areas when it comes to clothes: North Africa, the Levant, the Gulf and finally, Sudan. Walking through the streets of Rabat or Tunis we see many men and women donning Western clothes.So how can we tell if they are actually Moroccan or Tunisian, only by the way they are dressed? It is actually quite straightforward once we identify those robes or head gears that are unique to that country. Many Moroccans still wear the djellaba, a wide and comfortable hooded tunic with long sleeves which can be considered as a part of the national heritage. They are more colourful for women, while they are made in earth tones for men. Moroccans might accompany the tunic with the traditional slippers called balgha, which come mostly in yellow, but other colours are used, too. Spotting a traditional outfit in Tunisia may be quite challenging, especially in the cities. But a trip to the medina in Tunis or attending a marriage could give you a chance to admire the beauty of Tunisian traditional clothes. Karakou: Algerian women love colours and embroideries. This traditional embroidered jacket has made its big return on the Algerian fashion scene and is now used on important occasions and weddings. Young Libyans normally don jeans and t-shirts. However, it is sufficient to leave the city and approach the rural areas inhabited by the Berbers to see the original Libyan attire. Walking through Cairo means observing a wide range of clothes and attires: from women wearing a niqab, through hijabi girls and up to ladies who don’t cover their hair at all. Men’s clothing doesn’t tend to be as varied since polo shirts and jeans are worn by most male Egyptians. This notwithstanding, the inhabitants of some peripheral area of Cairo, as well as the great majority of the so called fellahin (farmers) still prefer more traditional and airy attires. Gallabya: much like the djellaba and the gandoura, the gallabya is also a long tunic without buttons or a proper neck. It comes in colourful and embroidered variations for women and in neutral colours for men. Egyptian sailor wearing a gallabiya Man in Cairo donning gallabiya and taqiya. Similarly to the countries in the Maghreb, Western clothes are predominant also in the Levant,especially in big cities such as Beirut or Damascus. However, there are also many local garments and attires that can be seen in the cities themselves, as well as the countryside. We have shown that all the countries in al-Maghreb have some items of clothing in common such as the gandura or the barnous, a hooded djellaba. The same is true for the Levant. Nonetheless, there are always some particular headgears or tunics which are unique to a certain country. Niqab, hijab, jilbab, jeans, t-shirts, khimar: these are only a part of the vast array of clothes worn by Jordanians. While in the western part of the capital Amman, Western style clothes are widespread; it is common to see more traditional and conservative attires in the area of downtown and eastern Amman, as well as in smaller towns. Shemagh mhadab: this red checked keffieh is widespread in the Gulf, too, especially in Saudi Arabia. It is the colour that is typical of Jordan as it stands for the values of the Bedouin culture: the bigger the tassels, the higher the importance of the wearer. Like Jordan the beauty of traditional Palestinian clothes has almost been forgotten, as most people in cities such as Ramallah or Jerusalem wear jeans and t-shirts if they are men; jilbabs, Western clothes and hijab if women. Sherwal: these baggy and comfortable trousers are also commonly seen in the Gulf under a dishdasha. They are one of the few traditional garments still worn by some Lebanese countrymen. They are used on their own, no thobe needed.They have also been recently reinventedin a more fashionable female version. Much like the other Levantinian countries, Syria has seen more and more men and women opting for Western style clothes. The majority of women wear a hijab and some sport a jilbab or even an abaya and niqab, while some older men can still be seen with keffieh and long tunics. Traditional clothes were once famous for the quality of their fabrics and the beauty of their embroideries, often in black and red. However, they have basically disappeared from the urban areas and are worn in the countryside only on special occasions. When it comes to the Gulf it is pretty easy to spot its citizens as, differently from most other countries in the region, they have kept wearing their traditional clothes. All men in the Gulf usually use a long, white tunic called dishdasha which helps keep the body cool in the heat of the region. This tunic is usually worn with short sherwal trousers and a ghuthra, alight, white headscarf or the keffieh, in the colder season. Women wear wide, long robes called abayas, usually in association with a shayla hijab that shows some hair and a niqab. Even if the thobes for the men and the abaya for the women may seem the same everywhere in the region, there are actuallysome small details that allow us to understand whether we are talking to a Qatari, a Kuwaiti or an Omani. Even if only 25% of the 2.1 million inhabitants have actually Qatari origins, there is a very strong national identity which is expressed through clothes, as well. Qatari fashion is similar to the Saudi Arabian one, but it is more colourful, especially on the women’s side. This country might not be as big as Saudi Arabia, but it has certainly nothing left to be desired when it comes to history, biodiversity and, of course, clothes. Their traditional clothes are in line with the other Gulf countries, but have some special features which differentiate them. The UAE has a complex fashion panorama. While Dubai is the most progressive and up to date among the emirates, the other areas are more conservative in terms of clothing. Fashion here has evolved incredibly fast and if in the past sirwal and burqa were a must for women, they have been substituted by the abaya and even the white thobe now comes in a variety of colours. The southern sultanate really cares about the integrity of its national heritage, clothing included. That’s why the traditional dress is compulsory for all employees in the public sector. Western style clothes have no space in the country, with the exception of tourists of course. Dishdasha: just like men, also Omani women of rural areas wear this traditional tunic in a great variety of colours and with rich details. They match it with loose fitting sirwals. This country has preserved an extraordinary heritage in terms of history and traditions. Clothes are just one expression of how much Yemenis still follow their customs and their outfits show the region they come from: the mountainous North, the coastal area of the West and South or atribal area. Still, it is not uncommon for men to wear Western clothes in the cities. The style of Sudan is unique and easily recognisable. Sudanese wear many of the garments which are widespread in the rest of the Middle East, but in a brighter and more colourful version which reminds us of other African countries. While Western clothes are indeed used especially in the cities, some still prefer the loose fitting traditional items. Ready to test your knowledge of Arab clothing? Take our Arab clothing quiz here. Clothing in the Middle East is important business, perhaps even more than in the West. Clothes reveal so many things about not only the personality, but also the region and social class of the wearer. Moreover, the choice of a certain item of clothing assumes a fundamental moral value. For example, some Arabs more or less consciously think that women without hijabs are more open minded, but also have fewer morals, while women with hijab are somewhat more religious and thus respectable. Thus, clothes in the Middle East are a fashion statement, just like they are in the West, but clothing has a stronger social and moral dimension, too. As we have seen there is an infinite variety of Arab garments and what we have listed represents only a minimum part of it. Clothes remain a fundamental element in the cultural identity of each country in the Middle East. Some countries have followed Western footsteps in terms of fashion, namely the Levant and North Africa, while others are still holding on tight to their traditional attires like Saudi Arabia or Yemen. While clothing might seem a superficial matter in Europe and America, this really is not the case in the Middle East. Clothes can give us precious info about the person in front of us while we are doing business or making friends and it is a useful key to understand the spirit of each Arab nation.